Even without being told that the blade part of the Pirate Dagger and Wheel Display was a pirate dagger, it is rather obvious that it is pirate themed. Everything on that blade is pirate oriented, from the pommel to the blade! 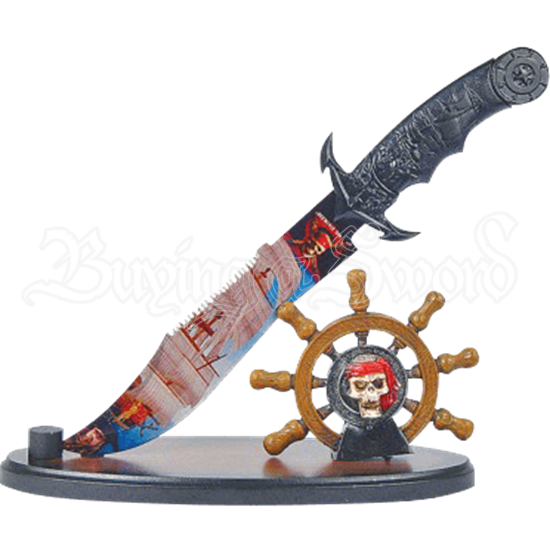 The hilt of this decorative stainless-steel dagger is crafted with the images of pirate ships on the handle. The pommel of the hilt is decorated with a ships wheel, while the crossguard is made to look like an anchor. 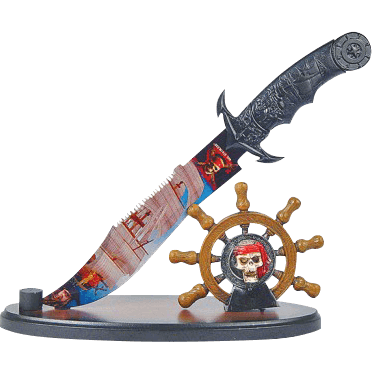 The blade of this ornate collectible, which displays a style reminiscent of a Bowie knife, has been heat transferred with a full-color image of a pirate ship and a skull and crossbones. The base that this decorative weapon rests upon is dark in color. A ships wheel, decorated with a pirate skull, stands on the display base, upon which the dagger rests. Bring a swashbuckling flair to any room of your home with this decorative collectible, or give it to a friend or loved one to add to their collection!